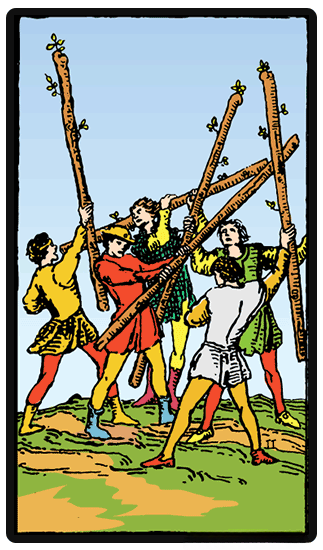 From the image on the card, the symbolism in the Five of Wands suggests that there is form of conflict in one s life. This may be an existing conflict or one that is brewing and may eventually blow up in one's face. It may also depict a problem in communication, for example in a situation where no one really wants to listen to the other - meaning that no agreement or understanding takes place. The five men may signify problems in a group of people who are not patient enough to listen to what anyone else is saying. They only want to be heard, and since none of the others will listen, they all argue at once. Much of this can be solved by the querent taking the first step to try and initiate communication in such a way that you suggest that everyone airs out what they have to say, one at a time. By doing this, you will be able to address the problem, and everyone will be heard. Meaning they ll all be satisfied. The Five of Wands can also mean that you are or will be facing competition in an area that you are not used to. This can be at work or school where you will meet people with the same abilities as you who pose quite a challenge - leading to feelings of jealousy, greed, and envy. This tarot card encourages that you accept the competition as a way for you to improve yourself without feeling any malice towards them. This means that you should learn how to cope with them in a civil way. This tarot card encourages that you accept the competition as a way for you to improve yourself without feeling any malice towards them. The Five of Wands meaning could also be a personal struggle that you are dealing with on your own. This can be on a number of issues that affect you, hence you need to address them and find a solution for them. You will need to identify where the problems are and offer a solution that will handle the case. The Five of Wands reversed meaning can be that your natural method of dealing with disagreements is avoiding any kind of conflict by getting away from that place as fast as you can. Sometimes this can be regarded as a good thing, but other times, it may lead to a number of issues that are brewing up within you, for which you will have to address soon. On the other hand, it can also mean that you have worked through your troubles and that you do not have any more issues to worry about.